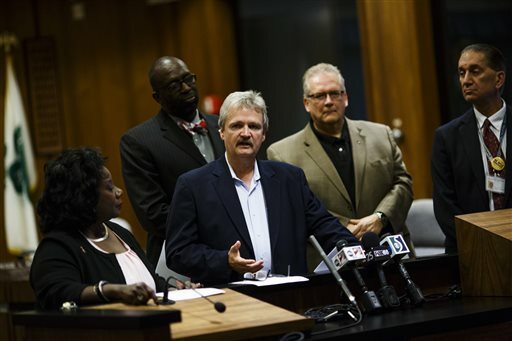 DETROIT (AP) — Officials in Michigan declared a public health emergency Thursday over the city of Flint’s water, after months of resident complaints about its smell and taste, in response to tests that showed children with elevated levels of lead. A day after Gov. Rick Snyder said the consequences of using the Flint River for the city’s drinking water weren’t “fully understood,” Genesee County Commissioners recommended that people not use the water unless it first goes through an approved filter at taps. Mayor Dayne Walling said Thursday residents should follow the county commission’s declaration on using filters certified for lead removal, having water tested and flushing cold water for five minutes before drinking it. “As evidenced by the ongoing poisoning of the children of Flint, it’s time for the EPA to take immediate action to provide us with a safe water source,” said LeeAnne Walters, a Flint parent and member of the Water You Fighting For group. Detroit’s water system serves about 4 million people in communities across southeastern Michigan. “This department is always willing to explore possibilities that may be beneficial … for the residents of Flint and the other communities that we serve,” William Wolfson of the Detroit Water Department told The Associated Press. Flint is among a number of communities that have complained about the rising cost of Detroit’s water and sewerage service. City officials estimated the cost of buying water from Detroit at $16 million. They turned off Flint’s tap to Detroit water in April 2014 and opted for Flint River water until the city switches to a new pipeline from Lake Huron. The overall annual cost to be part of the Lake Huron system would be $12.5 million. “In terms of a mistake, what I would say is we found there are probably things that weren’t as fully understood when that switch was made,” Snyder said Wednesday. More concerns surfaced after Virginia Tech researchers posted an online report in early September saying Flint’s water is “creating a public health threat” in old homes that have lead pipes or pipes fused with lead solder. But Kary Moss, director of the American Civil Liberties Union of Michigan — one of the group’s filing the petition with the EPA — says the first step has to be removing the Flint River as the city’s source of water.